Apricot Almond Pastries - Let the Baking Begin! Every once in a while we all want something, quick, delicious and super easy. This is where these Apricot Almond Pastries come in. They come together in just a couple of minutes, and the flavor is amazing. 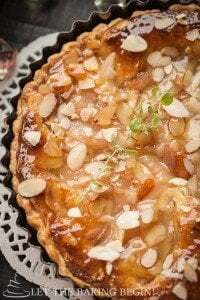 The addition of the almond flakes gives the pastries a nice crunchiness while the cream cheese and the apricots are nice and creamy. With the apricots still in season here in the Northwest, it is nice to make use of the seasonal fruits that are in such abundance during summer. 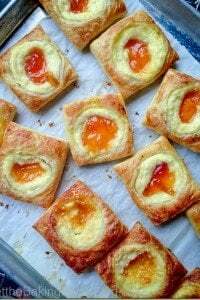 But, even after the apricot season, you will be able to make these lovely Apricot Almond Pastries with canned apricots or even peaches, if the peaches are somewhat small. The only thing you have to beware of when using fresh apricots, you need to use the sweetest apricots you can find. If they have even the tiniest amount of tartness, when then bake them, they will be even more tart. Totally fixable with a good dusting of powdered sugar, but just something to be aware. On a floured surface open up the puff pastry sheets and cut them into 9 squares each. Whisk 1 egg yolks with 1 tablespoon water. 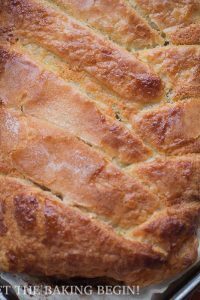 Transfer puff pastry squares to a parchment paper lined baking sheet. Brush the squares with egg wash and sprinkle with caster sugar. Whisk 1 cup room temperature cream cheese, 1/3 cup granulated sugar, 2 egg yolks and 1 tsp of cornstarch or semolina flour until smooth. Put about 1 tablespoon of cream cheese mixture in the middle of each square and top with 1/2 of an apricot. Sprinkle the edges of the squares with 1/3 cup almond flakes/slivers. Bake in preheated to 400F oven for about 15-18 minutes, or until the edges are golden in color. Heat 3 tablespoons of apricot, pineapple or peach jam and brush it on top of each apricot. 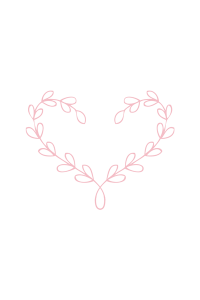 Allow to cool and serve. Sprinkle with powdered sugar if the pastries need additional sweetness. Nutella Puff Pastry Danish – Danish pastries filled with Nutella chocolate. 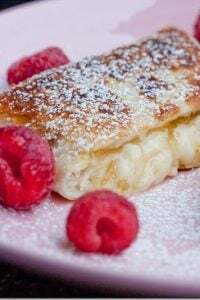 Cheesecake Danish Recipe – Cream cheese filled danish with a lemon glaze. 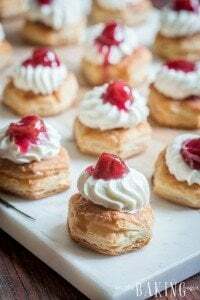 Almond Cream Puff Pastry Braid – A pastry danish braid with almond filling. Brush the squares with egg wash and sprinkle with turbinado sugar. Sprinkle the edges of the squares with 1/3 cup almond flakes or slivers. Heat 3 tablespoons of apricot, pineapple or peach jam and brush it on top of each apricot, for better presentation. Allow to cool and serve. Sprinkle with sugar if the pastries need additional sweetness. Made them as the photo looked good, and I had some apricots in my fridge which wanted to use up. Absolutely delicious, glad I made them and thanks for the recipe. These look luscious and I am anxious to make them. Where do you find your almond slices , and what are they called? They look much different than the ones I see in the grocery aisle. Thanks Denise! I get the almond slices at Trader Joe’s. They also sell them in bulk sections of other grocery stores, but those usually are not peeled, so they have brown colored edges of the peel. Both will work the same though.